Experience the modern look and lasting quality of the flooring products we offer at our expansive showroom. Vinyl is the perfect choice for homeowners that are interested in affordable, stylish, easy-maintenance flooring. Our selection of vinyl flooring in Longmont, CO, stands the test of time while infusing your home with an advanced new approach to interior design. When you purchase your new vinyl floors from our store, we work with you at every step of the process. We focus on your complete satisfaction with each and every step you take. We don’t stop at vinyl flooring; we are more than happy to help you with every aspect of your home redecoration or remodeling plan. When deciding on floors, it is important to know the overall aesthetic you want out of the end-product. With our help and low prices, you are sure to be able to get exactly what you want out of each room. Beautiful floors at an affordable price are the first step in creating the home of your dreams. Stop by today to begin the process of designing the perfect room around the floors we offer. Whether you know exactly what you want in a new set of floors or you are just beginning the design process, stop by our showroom for the help you need. If you’re still on the fence about the material or style you want, our design experts are more than happy to help you choose. 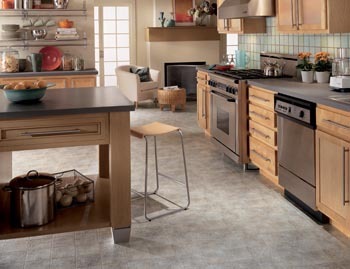 Change the ambiance in your home with vinyl tile flooring. We offer a quick and affordable way to bring style and elegance to any room. Our selection includes all the most popular styles and colors, ensuring that you find something in our showroom at that matches your decor. This durable and versatile product is a favorite for homeowners that want to improve the look of their homes without breaking the bank. Our collection of vinyl tile floors includes flooring that mimics the look of such high-end materials as natural stone and tile. With an elegant and timeless look, your new kitchen and bathroom flooring gives your rooms an upgrade. Start transforming your home with a new vinyl floor. When customers have a house filled with kids and pets, they depend on the durable and scratch-resistant vinyl sheet flooring we offer at our showroom. You don’t have to sacrifice your favorite styles and colors in order to get a product that withstands the impact of family traffic. Our sheet flooring keeps your home looking as good as new. That’s because it is easy to maintain and very resilient. Simply sweep to clean up dirt and mop occasionally. It’s an easy and affordable option that homeowners love. Find out for yourself why so many people have been turning to vinyl when they need new floors. If you live in an active household, you understand just how much damage your floors are exposed to. From shifting furniture to playful children to running dogs, the amount of scratches, drops, and spills are enough to ruin weaker flooring in no time. Vinyl sheet flooring is the solution you’ve been looking for to hold up to any damage you can imagine. Highly resilient to scratches and damage, as well as stains and water, vinyl lets you enjoy the fun of having a family without stressing about damage to your floors. Combined with the low maintenance, it has never been easier to lay floors and forget about them for years without them degrading. Enhance the ambiance in your home with vinyl plank flooring that adds an air of beauty to any room. When you are ready to rejuvenate the design of your home, our elegant and affordable plank flooring is the solution. It looks like wood right down to the grain patterns, whorls, and finishes. You’ll find that it makes an immediate impact on any visitor to your home, and you won’t spend a fortune in the process. We want you to get not only the best floors you can, but also the home design you’ve always dreamed of. By offering you an affordable flooring option, we allow you to spend the money you save enhancing the rest of your home. Are you tired of your worn-out floors? Give your feet something better to stand on. Every member of our flooring family is committed to ensuring you get the most for your flooring investment. With the vinyl flooring installation from our experienced installers, we make sure you have floors that stand the test of time and look great each and every day. Flooring installation requires the precision and dedication of a trained professional, and our team is there for you until the job is done right. Our focus is on your complete satisfied. That’s why are so proud of our strong customer base and excellent reputation in the community. We take a detail-oriented approach to vinyl flooring installation, thoroughly preparing before beginning the process. Our contractors measure everything out ahead of time to make sure that we have everything we need when the installation begins. We then clean up thoroughly after we’re done. You won’t notice any trace of our presence once we leave besides the beautiful new floors you deserve. Contact us today for a free estimate on new flooring that you have always dreamed of. We proudly serve the customers in Longmont, Niwot, Frederick, Firestone, and Louisville, CO, as well as the surrounding areas.